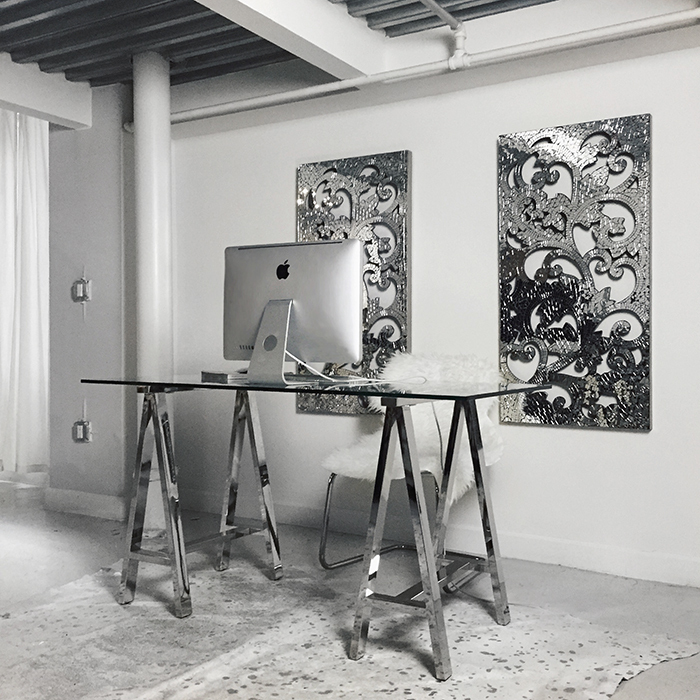 Today’s post is featuring one of my favorite spaces in my loft! I’ve been working on making over my office area in my apartment for quite some time + today is the day I can finally share it with you! My bedroom used to be on the lower level, but I moved it upstairs + have been transforming the space into an office for the last few months. Was waiting to find the perfect pieces + that of course didn’t come without some classic disasters [my desk top was lost in shipping, etc]. Now that I’ve finally got all of the pieces together, it’s time for the reveal! I’m someone who is very affected by their surroundings- it’s almost impossible for me to work if my apartment is cluttered or disorganized. I needed to create a space that was clean and organized, but also comfortable. For me, that means also having fresh flowers + a scent for the room to make it feel relaxed. 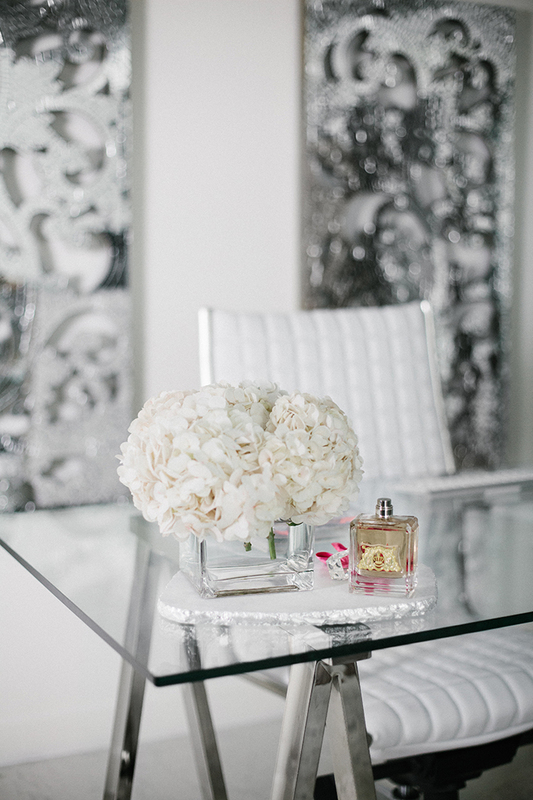 My current favorites: hydrangeas and Juicy Couture’s Viva La Juicy. I like to spray this throughout my office to make it more inviting and enjoyable to spend long periods of time in. In case you were wondering about this scent, it has notes of sandalwood + vanilla [right up my scent alley. All of my scents usually have some mix of woody slash sweet vibes] but it isn’t overwhelming dark or sweet- it’s light enough to wear all day or spray throughout a room. It also has some floral notes, which match beautifully with the fresh flowers. I’m really happy with the combination! Click below for links to items shown. This entry was posted in Home Decor, Uncategorized. Bookmark the permalink. 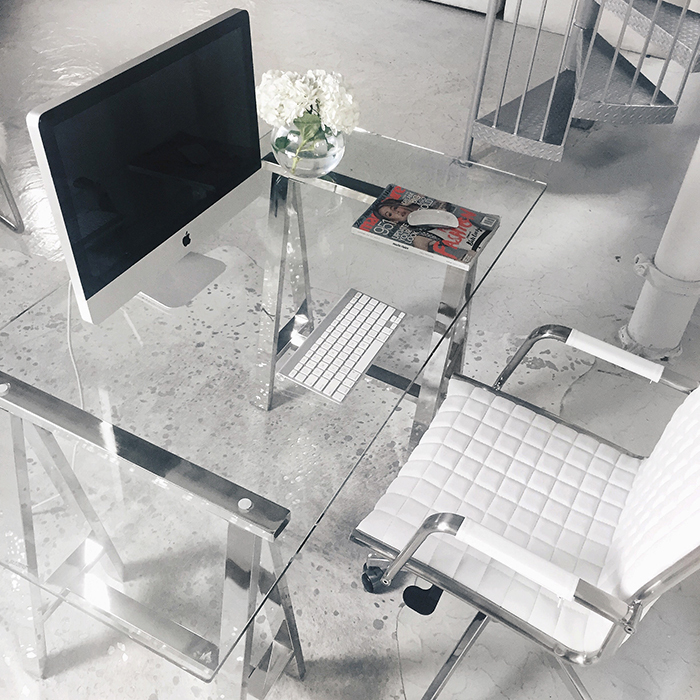 love how clean and minimalist this is because I can’t stand clutter in my office space! your decor is always the best! This office is my DREAM!! Ahhh! It’s killing me following you, knowing I have two children, a husband, and pets. If my office were styled this way I’d be BEYOND happy. I like you am very affected by my space. I like clean, minimalistic decor for that very reason! oh wow your office looks gorgeous! What an amazing space to work in!